Abraham Ulrikab was an Inuk from Labrador who, with his wife, two daughters, a young relative, and another Inuit family, agreed to go to Europe to be part of an exotic traveling show, a human zoo. Ulrikab, a devout Moravian Christian, spoke three languages and played violin, guitar and clarinet. Ulrikab kept a travel diary during his voyage to Europe and also wrote letters to Brother Augustus Ferdinand Elsner, the Moravian missionary who was his teacher in Labrador. These are the only personal records of the short, tragic time he and the others spent as part of the ethnographic exhibition. Abraham was born on January 29, 1845 in Hebron, to Paulus and Elizabeth, one of at least four other children. He was baptized on February 25, 1845. At this time the Inuit did not use surnames; it was customary for married people to take the first name of their spouse so Abraham Ulrikab meant Abraham, husband of Ulrike1. In the late 1800s, Carl Hagenbeck, known as the creator of the modern zoo, began to exhibit human subjects in Germany. He found great success in ethnographic shows that included “primitive” exotic races such as “Nubians,” “Laplanders” and “Eskimos.” Seeking to recruit more families, Hagenbeck hired a Norwegian, Johan Adrian Jacobsen, to travel to Greenland to bring a group of Inuit back for his zoo. He had no luck there and ended up on the coast of Labrador at the small village of Hebron, where Moravian missionaries lived with the Inuit. The missionaries were very much against the idea of their Christian charges accompanying Jacobsen back to Europe, feeling it would expose them to “moral dangers” which had “proved very injurious to a company of natives of North Greenland similarly exhibited” three years before (Rivet 53). 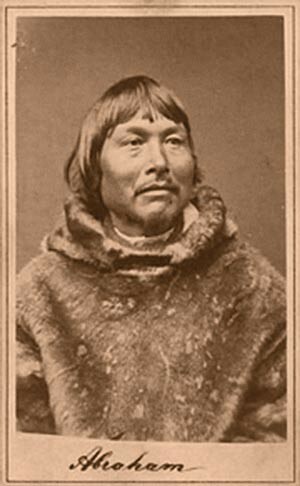 They would not allow Jacobsen to court the local Inuit, but he did manage to hire one, Abraham, to help him find non-Christian Inuit in Nachvak. Attracted by the opportunity to earn money to pay his debts, Ulrikab was convinced to go to Europe. He brought his wife Ulrike, 24 years old; and his daughters Sara, 3 years old; and Maria, 9 months. They were accompanied by a young man, Tobias,2 and a non-Christian family: Tigianniak, 45 years old; his wife Paingu, about 50; and their daughter Nuggasak, 15. Jacobsen was aware that the group must be inoculated for smallpox to enter Germany but there was no doctor in Labrador. He planned to have it done as soon as they arrived in Europe. On August 26, 1880, they set sail for Hamburg, Germany. According to Jacobsen’s diary the going was rough and the Inuit suffered from sea sickness. When they arrived on September 24 Jacobsen became very ill and neglected to obtain their vaccinations. They were put on display at Hagenbeck’s zoo immediately, performing daily with demonstrations of skills such as harpooning and kayaking. A few weeks later they traveled by train to Berlin to stay at the zoo there. Ulrikab experienced culture shock and wrote about the constant unbearable noise in the cities. The crowds of people that came to see them were relentless, pushing up to them and even inside their dwellings. At one point he writes that he took up a whip and harpoon and “made [himself] terrible” to chase a crowd away (Lutz 41). The damp climate gave them all constant chills and runny noses. In one of his letters, he writes about how Tobias was beaten badly with a whip by Jacobsen for misbehaving and became very sick afterwards. He also writes of the bad food: too much bread and very little of what they were used to. There is only one high point in their travels, when they were visited by members of their church, eight Moravian brothers and sisters. That seems to be their only joy in the trip although Abraham wrote that Tobias delighted and cared for the children that had come to see them. The Inuit were seen as a vanishing race. One Berlin newspaper describes the drastically declining population of their homeland: “One can almost predict the year when the people of the Labrador Eskimos will be entirely gone from earth” (Oct. 26, 1880 Abendausgabe). When the Inuit did get sick from smallpox, it took them quickly. The first, Nuggasak, died in Paris on 14 December. Ulrikab wrote his last letter to Brother Elsner from Paris. “Terrianiak’s daughter, [she] stopped living very fast and suffered terribly. After [her] mother also died, greatly suffering as well” (Lutz 55) Paingu passed on 27 December and Sara four days after her. The remaining five were vaccinated on 1 January 1881, but it was far too late. They all died within the next few weeks. Ulrike was the last to pass, on 16 January. Ulrikab’s diary as well as some other possessions were sent back to Hebron. A missionary, Brother Kretschmer, translated the diary to German. The original, in Inuktitut, went missing. Their bodies were never returned to Labrador. The translation was discovered in 1980, almost a century later, by James Garth Taylor, who published an article about Ulrikab in Canadian Geographic in 1981. In 2005, Hartmut Lutz and Hilk Thode-Arora, with the help of students from the University of Greifswald, Germany, published The Diary of Abraham Ulrikab: Text and Content. This included Ulrikab's diary as well as extracts from German newspaper articles and parts of Jacobsen’s journal. In 2010, after reading The Diary of Abraham Ulrikab, France Rivet was inspired to try to discover more about the families. Rivet eventually discovered that the remains of Abraham, his wife Ulrike, his daughter Maria, Tobias, Tigianniak, and the skull cap of his wife Paingu are located in a French museum. Rivet also found that the skull of Abraham’s Daughter Sara is part of a collection in Berlin. Rivet published her discoveries in a book, In the Footsteps of Abraham Ulrikab, 2014. As of yet, their remains have not been brought home. 1. In Europe, Abraham and his daughters were given his father’s first name as a surname, so Abraham Paulus. Ulrike gained the last name Henocq. The non-Christian family were not given surnames. 2. Some documents suggest that Tobias may have been a nephew of Ulrike or Abraham. Others say he was just a young bachelor (Rivet 49).